i’m done with another season of softball. there’s still another 6 days left in the season, but since i’m going back to school tomorrow (sigh the responsibilities), i’m out. why do i keep going back? i complain about it for sure, but in the end, i still like doing it. most of the girls are pretty chill (don’t ask me about the season i coached basketball with my friend and the most influential girl had basically turned the rest of the players against us). plus, i like knowing that i’m needed; sometimes when i volunteer, i stare around and do nothing and get bored out of my mind, which isn’t the point of volunteering (to me; ask high schoolers who need the hours for school or club credit, and they might give you a different answer). anyways, let’s get to this creamy corn and oyster mushroom zucchini pasta. i admit, i’ve been on a bit of a zucchini pasta rampage this summer: pesto eggplant pesto zucchini pasta, and vaguely thai zucchini pasta. but a little [zucchini] party never killed nobody! 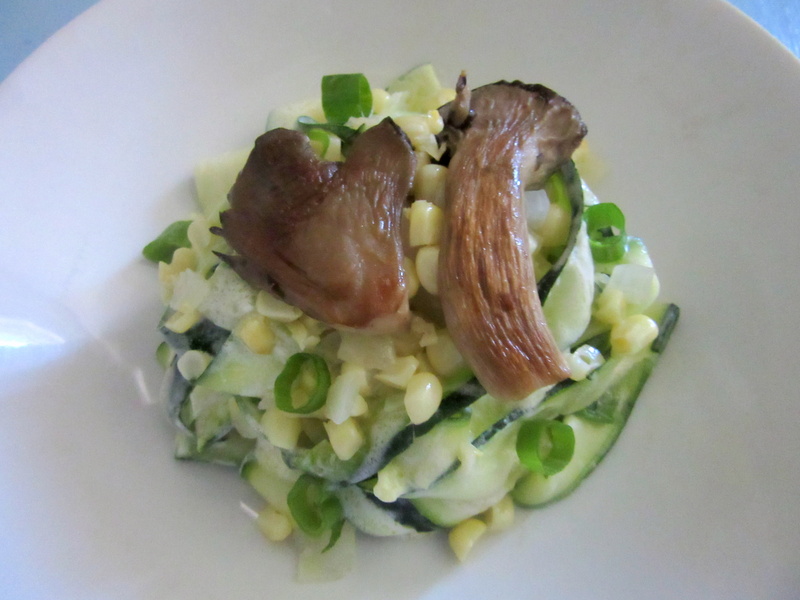 here, zucchini pasta is paired with corn, mushrooms, and a yogurt sauce that i posted about back in january. it started as a corn, bacon and shiitake mushroom pasta with a cheesy, creamy sauce from andrew carmellini… and then it wasn’t. the bacon disappeared, oyster mushrooms checked in for the shiitake, the cream sauce became a greek yogurt sauce, and the wheat pasta turned into zucchini pasta. i’m posting this recipe now in hopes that you’ll use fresh corn (it’s almost the end of the season!). HOWEVER, frozen is totally fine. i won’t tattle. you can add a bit of extra sugar if you find that your corn is a bit bah. this creamy corn and oyster mushroom zucchini pasta yields a meal filled with silky zucchini pasta and creamy sauce with a bit of fruitiness from the olive oil, and a hint of umami from the fish sauce. the mushrooms are an almost meaty contrast to the juicy, snappy corn. there’s freshness from the green onion, and a touch more salt from the feta. you could definitely sub in parm or ricotta salata for the feta. and if you want more protein, might i suggest grilled chicken, grilled shrimp, or fresh mozzarella? anything light that goes with the rest of the dish and doesn’t overwhelm it. this is not the place for fried chicken. *You can peel the zucchini if you want, but I like the pop of color that the skin adds. Don’t worry if you have some ugly stubby ribbons, or uneven pieces; you won’t be able to tell when you eat it. I use the whole zucchini, even the seedy middle; why waste that? And then I snack on the bits that I can’t peel (or you can saute it and then snack). And yes, you can use 1 lb normal pasta instead if you want. **You want a Greek yogurt that doesn’t have a bracing acidity, and that is pretty smooth. I always use Trader Joe’s plain whole milk (less fat means not creamy enough for this) Greek yogurt (the short one in the blue package). In a medium pan over medium heat, heat a bit of oil. Saute the corn, onion and garlic until the corn is tender (it shouldn’t taste starchy) and the onion is translucent (don’t let it caramelize). Transfer the corn to a bowl. Add more oil to the pan, and saute the mushrooms until browned and the liquid that they give off has evaporated. Transfer the mushrooms to the bowl with the corn and mix. Add more oil to the pan, and saute the zucchini until bright green and just tender. In a large bowl, combine the Greek yogurt, olive oil and fish sauce to taste. Add the zucchini and toss until well coated. Don’t worry if the sauce seems a bit loose; it will still be delicious. 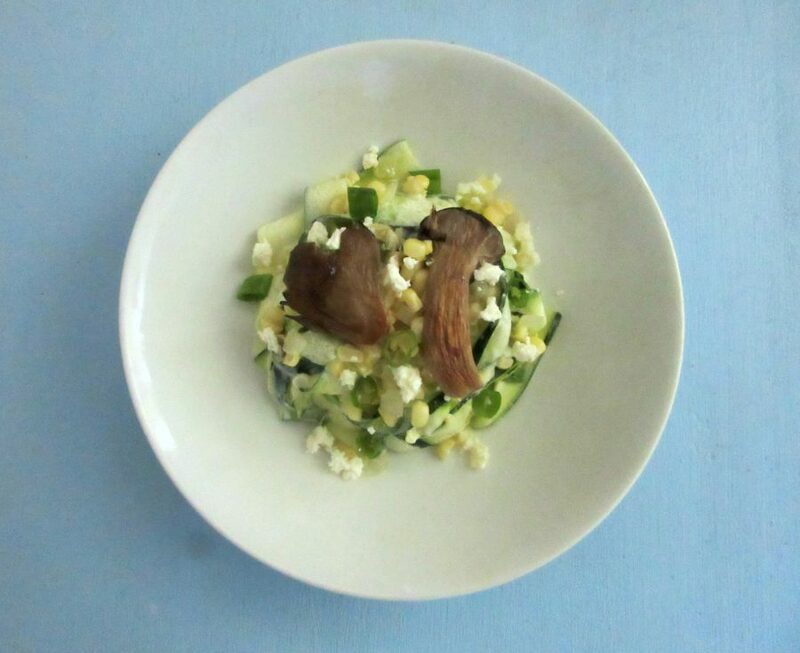 Serve the zucchini topped with the corn and mushrooms, sprinkled with green onion and feta. Ooo, this looks so yummy. I definitely have a hard time with zucchini (I get a stomach ache every time I eat it…), so I’ll probably add a thick pasta instead. Also, with the softball, I think it’s great that you keep doing it. If volunteering is always easy, then it wouldn’t be worth it! I think you do a great thing by always returning to it! I LOVE zucchini noodles. They’re so versatile! same! i haven’t tried it with any “traditional” sauces (ie marinara, carbonara, etc) yet because i’ve been having too much fun coming up with different, quick and easy ones. Not a combo I would’ve dreamt up on my own–love it! Oooh and good luck with the new school year and all, girl! Pasta me up, pleeeease.